The garage is the workhorse of the home, so why not make it work a little harder for you? 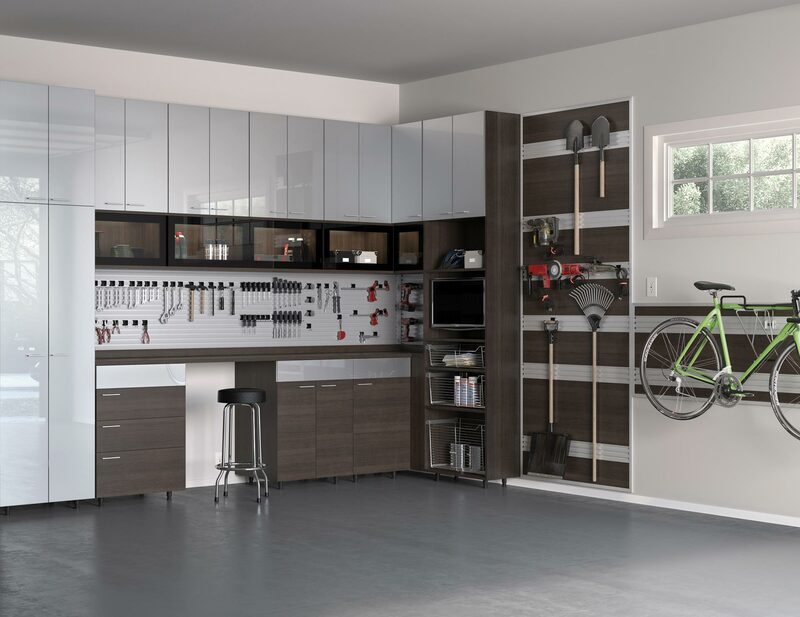 Custom-designed cabinetry, drawers, shelves, and specialty racks create a purposeful room for efficiently storing garden and snow tools, sports equipment in the off-season, keepsakes, and even holiday decorations. Maintaining order, improving organization, and actually making room for the car, will simplify your life. Deep custom-designed storage cabinets organize everything from seasonal décor to sporting goods. Durable drawers hold smaller items, including workshop accessories like nails, screws, and sandpaper. Baskets provide easy access to items that are often needed. 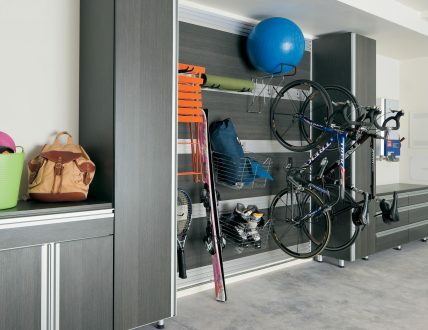 A Fusion Track Wall System neatly stores anything from large tools to auto equipment securely to your garage wall. Deep countertops offer a large work surface area. 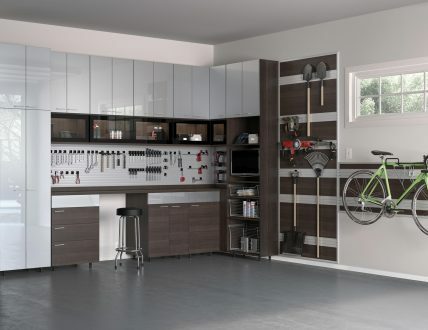 A place for tools, supplies and a workbench to boot, this storage system provides an ideal spot for working on projects. This well-organized garage provides enough room to build, fix and play with features that allow easy access to every organized item. Lago® Milano Grey finish sets the tone for a neutral palette. Lago® Milano Grey slab door and drawer fronts contribute to the seamless look. Fusion Track Wall System with accessories provides storage for tools. 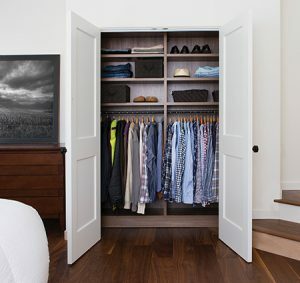 Large storage cabinets offer storage for tall items. 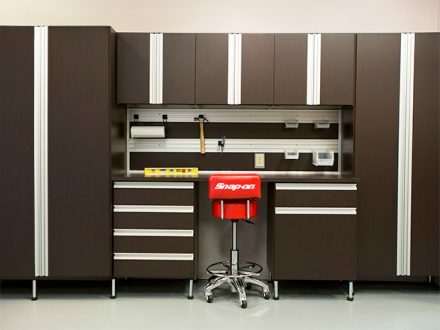 The ultimate workbench — with incredible storage — provides a space for every tool while keeping clutter at bay. Lago® Venetian Wenge finish creates an industrial look. Lago® Venetian Wenge slab door and drawer fronts contribute to the seamless aesthetic. Integrated extruded Matte Aluminum finger pulls make opening and closing drawers and storage cabinets easy. Adjustable feet keep the system off of the floor. Integrated workstation creates a designated space for projects. Drawers offer organization for small tools and objects. 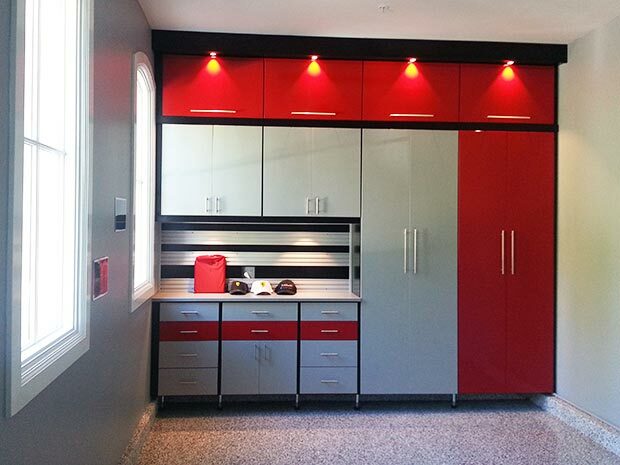 The ideal home for a client's new Ferrari, this stylish garage incorporates glossy finishes with a pop of colour. Classic Milano Grey provides a neutral backdrop. High-gloss acrylic Parapan slab door fronts in red and white add sleek colour to the space. Fusion Track Wall System with accessories provides a place for tools. Efficient LED puck lighting illuminates the space. Sleek, modern Brushed Aluminum hardware adds polish. Flip-up mechanism for doors optimizes accessibility. 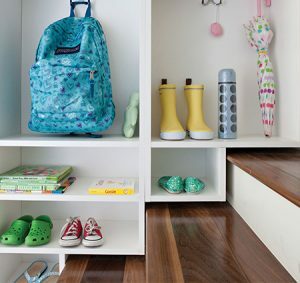 Concealed storage cabinets include adjustable shelving for changing needs. 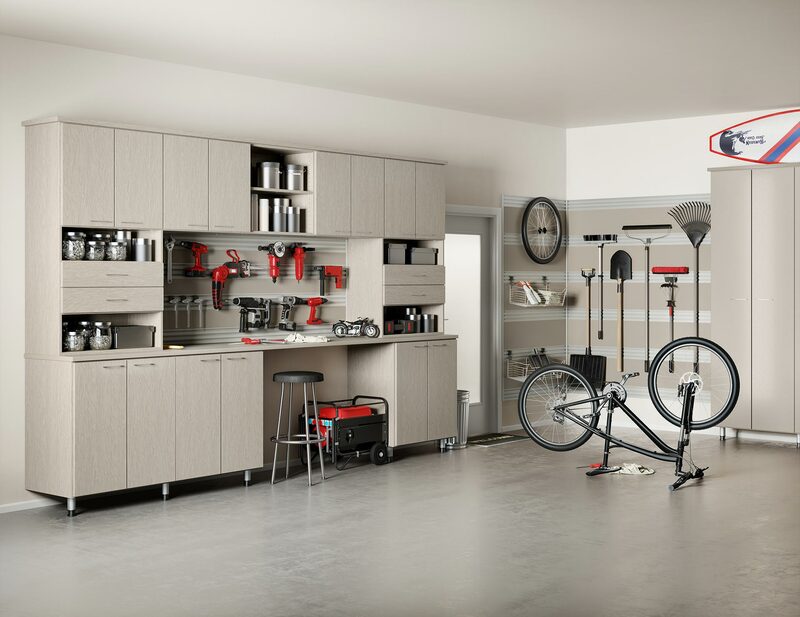 Closed storage cabinets with multiple types of drawers ensures that every item has a specific place, creating a well-organized garage. Lago® Adriatic Mist finish creates an airy colour palette. Lago® Adriatic Mist slab door and drawer fronts contribute to the seamless look. Integrated Aluminum extrusion finger pull detail extends the full length of the door for a seamless industrial look. Classic Cashmere countertop complements overall look. Stylish horizontal and vertical storage cabinets transform this garage from cluttered to functional. Lago® Milano Grey system creates a durable look. Powder-coated Black Aluminum frame sliding doors with clear glass inserts offer easy viewing. Milano Grey slab doors and drawers create a seamless aesthetic. Fusion Track Wall System with accessories and Milano Grey inserts create storage for tools and bicycles. Brushed Chrome baskets offer accessible storage for sporting equipment. Brushed Nickel decorative hardware adds polish. Integrated workstation with black countertop provides a designated project space. 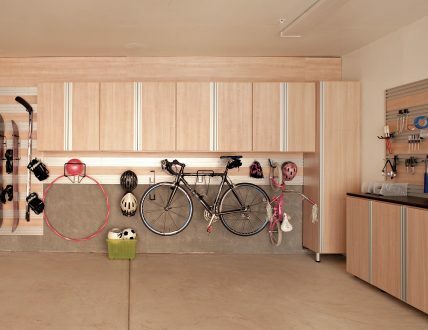 With plenty of storage and a variety of organization options, this garage blends function with smart style. Fusion Track Wall System with accessory hooks for storing gardening tools and sports equipment. Additional Fusion Track Wall System over countertop for easy access to smaller tools and supplies. Ample counter space for working on projects. Large storage cabinets offer space for oversized items. Cabinets help conceal clutter and keep the garage looking tidy. 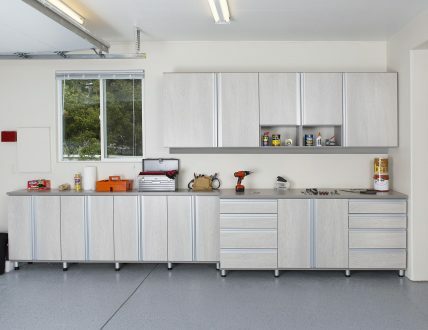 With the right storage cabinets, your garage will become an organized extension of your home and the perfect place for partaking in your favorite activities.